Cadence® employees have written or contributed to a number of excellent books about processor-based design, design automation and verification. Here are some of the best. 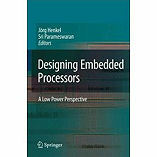 Published by Springer - Order now. Published by Prentice Hall PTR.